It had been a trying week; many hassles and challenges from missing socks in the dryer to a nasty note from the NSA saying that we’re going to have to speak louder for them to get usable recordings. It’s always something. So Cindy and I were way ready for some saltwater marinating. 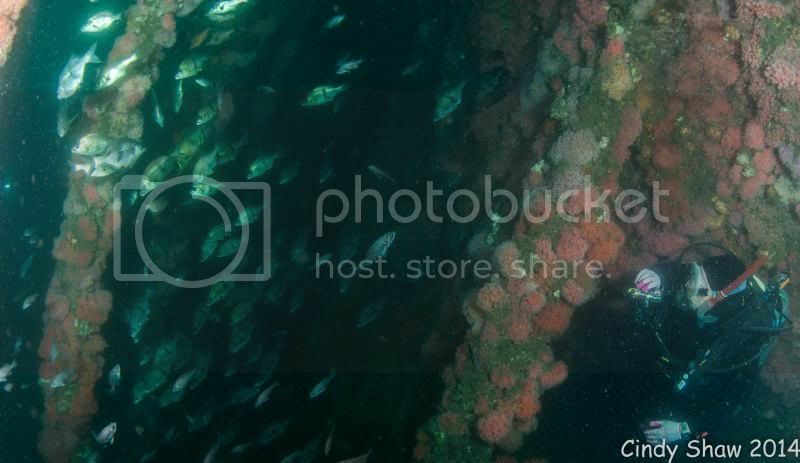 Friday evening we headed to Long Beach and boarded the dive boat TRUTH in Rainbow Harbor. 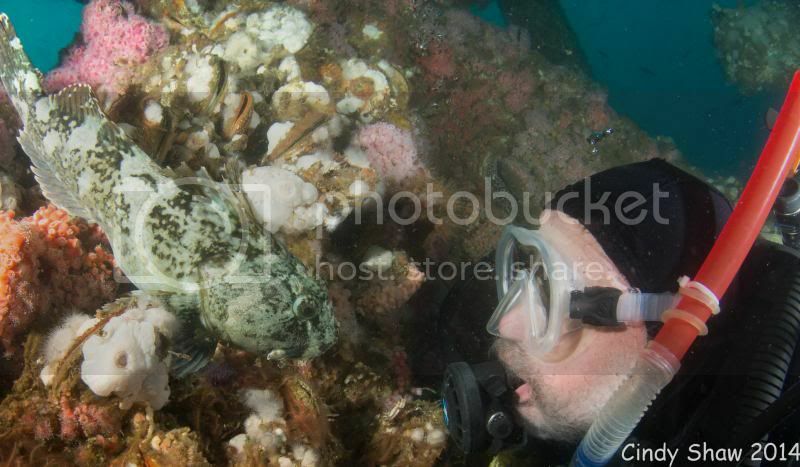 Ken Kollwitz of Channel Islands Dive Adventures had set up the trip with bunk assignments ready when we arrived. After chatting with some of our fellow divers, we turned in and fell asleep anticipating the diving to come. Long Beach Light on a gray, overcast morning. …destination, the Olympic II, ex-Star of France. Launched as a three-masted square-rigger, she had a long an exciting career spanning the globe. 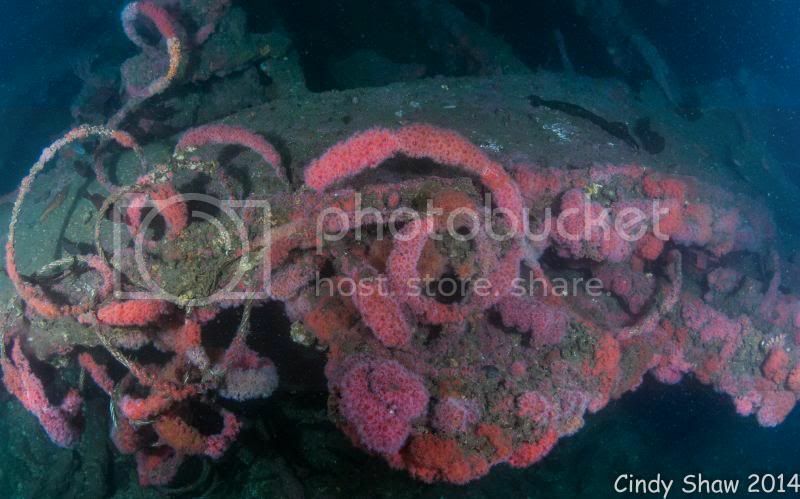 She was demoted to lowly fishing barge status as steam-engines became the standard propulsion for ocean-going vessels. 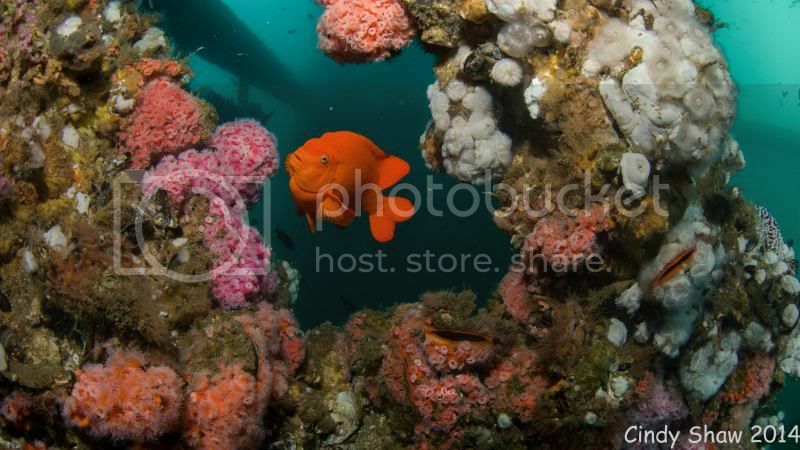 Sunk in a collision in 1940, she has been one of SoCal’s choice dive locations for many years. Despite gray, overcast skies, sea conditions were fine and in less than an hour we were anchored over the old sailing ship and getting our briefing from Captain Davey. Moments later we were splashing in and following the anchor line down to the Olympic. 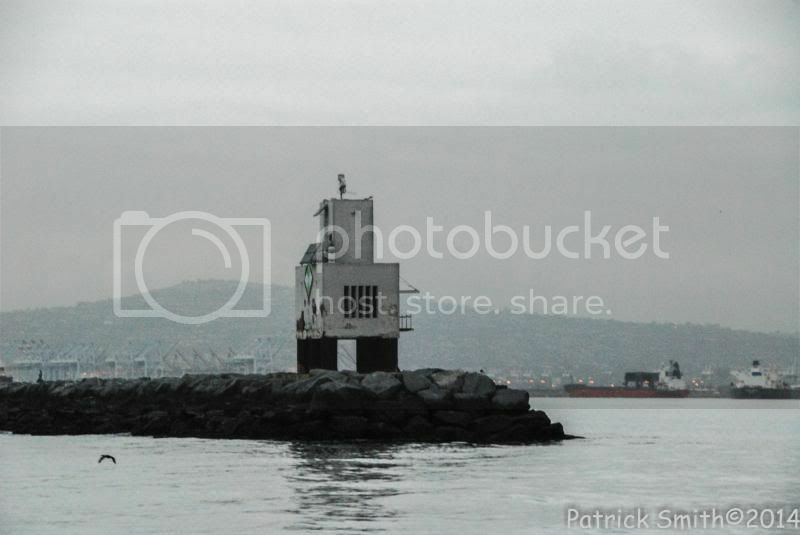 Visibility was reasonable – 25-30 feet but pretty dark with the overcast skies. On the bottom we had a bit of a surprise. 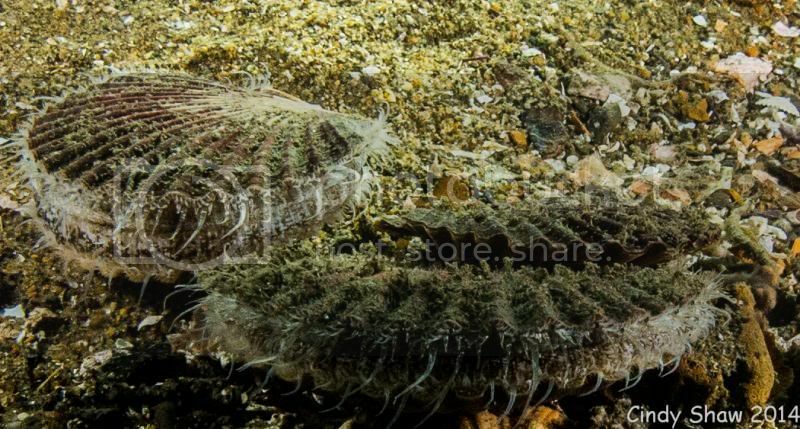 Cindy and I came down in the middle of a party of Pecten diegensis or San Diego Scallops as they are commonly known. These guys are very cool because when they sense a threat, they jet off the bottom and flap till they feel safe (or till they get tired). Apparently Cindy swimming over the bottom freaked them since she was leaving a cloud of scallops in her wake. 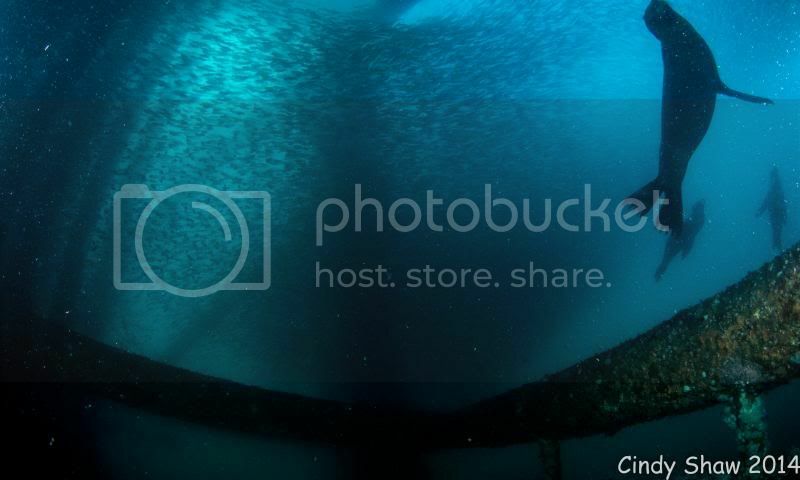 With the placement of the anchor exactly on the collision point on the wreck, we opted for the stern and shot the schools of fish that swarmed the stern structure of Olympic. 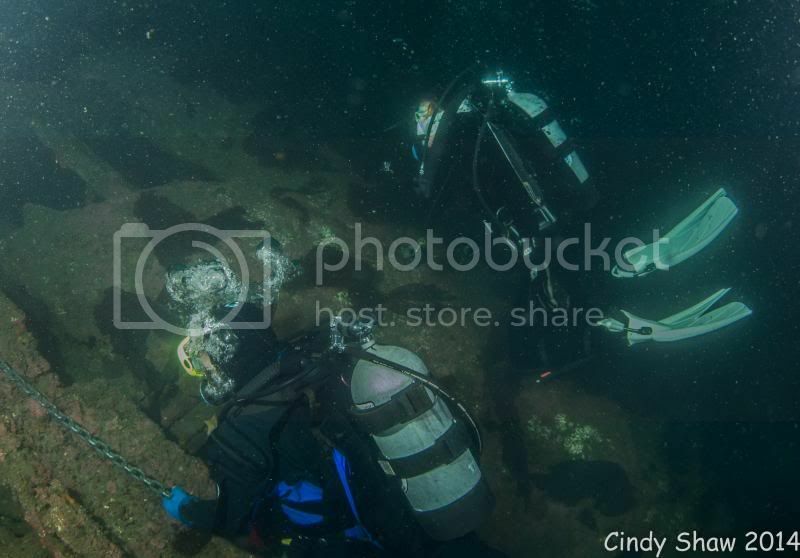 On surfacing from the dive and marking our tanks for fresh fills of 32% Nitrox, we followed our noses into the galley where Patty the cook was preparing tri-tip breakfast burritos, bacon, toast and eggs cooked to order. 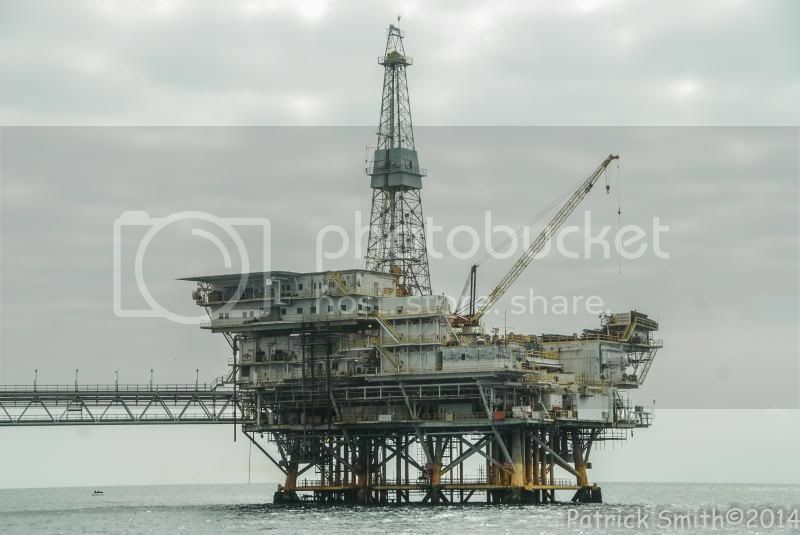 We chowed down as we made the short trip out to oil rig Ellen. 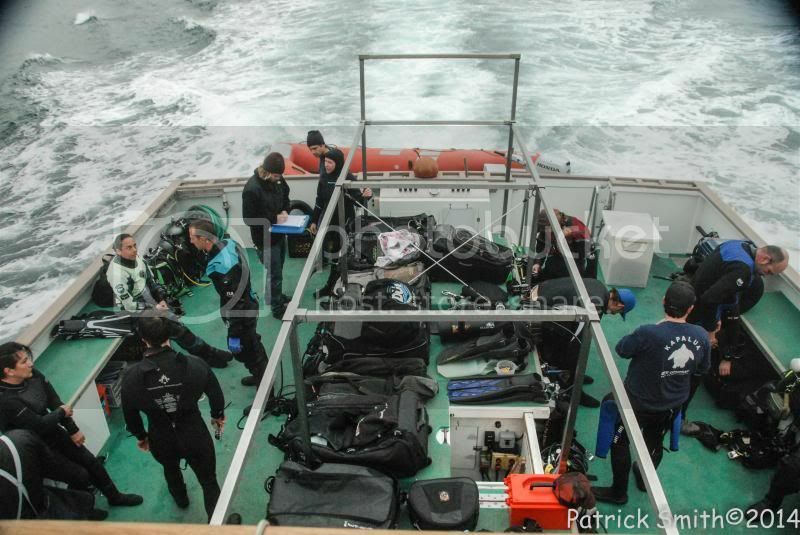 Plenty of room even with 30 divers aboard! 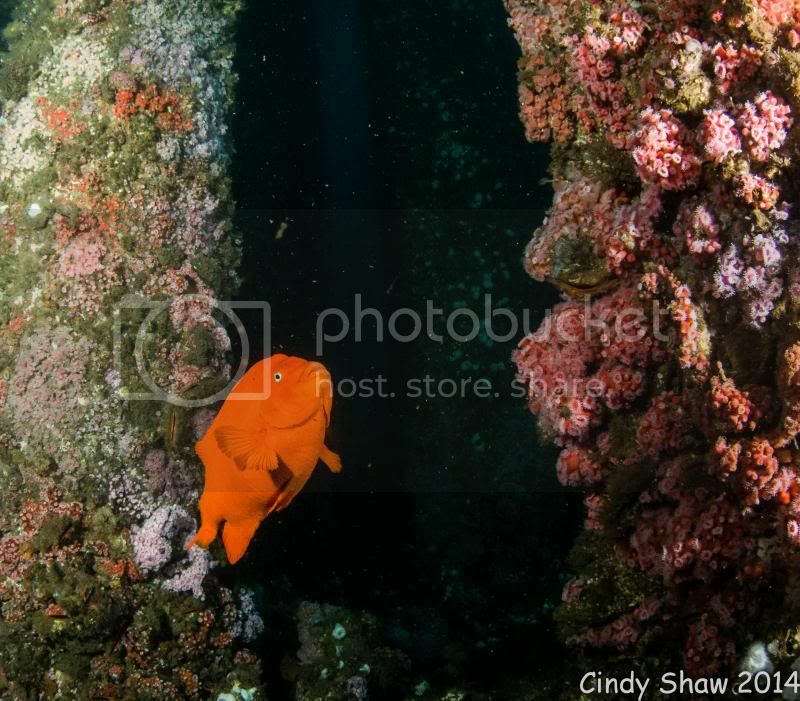 Our next dive was on oil rig Eureka and while we motored over to the new site, lunch was served – roasted chicken, broccoli, seasoned rice for the meat-eaters and steamed vegies and salads for the gluten-free and vegetarians on board. Hunger is NEVER an issue on the Truth. 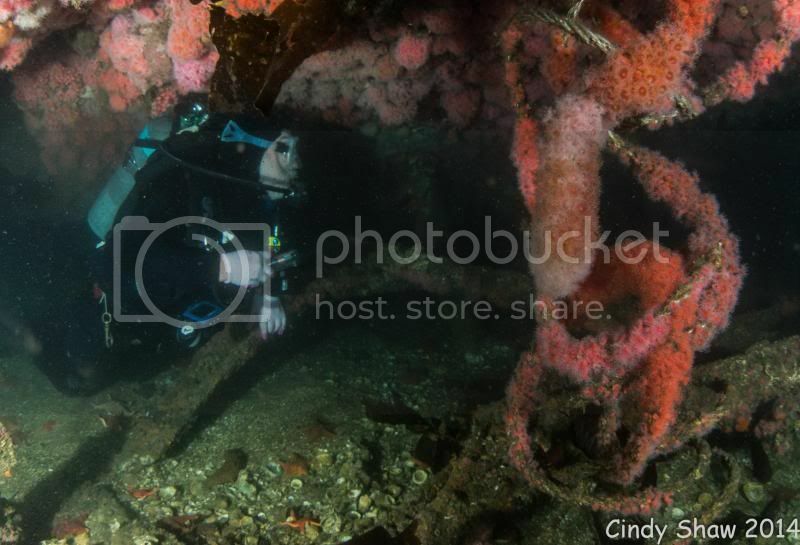 For the last dive we found conditions similar to what Ellen provided with a bit better visibility (40+ feet) and a bit cooler water (59 degrees) with plenty of sea lions to keep you from getting bored. 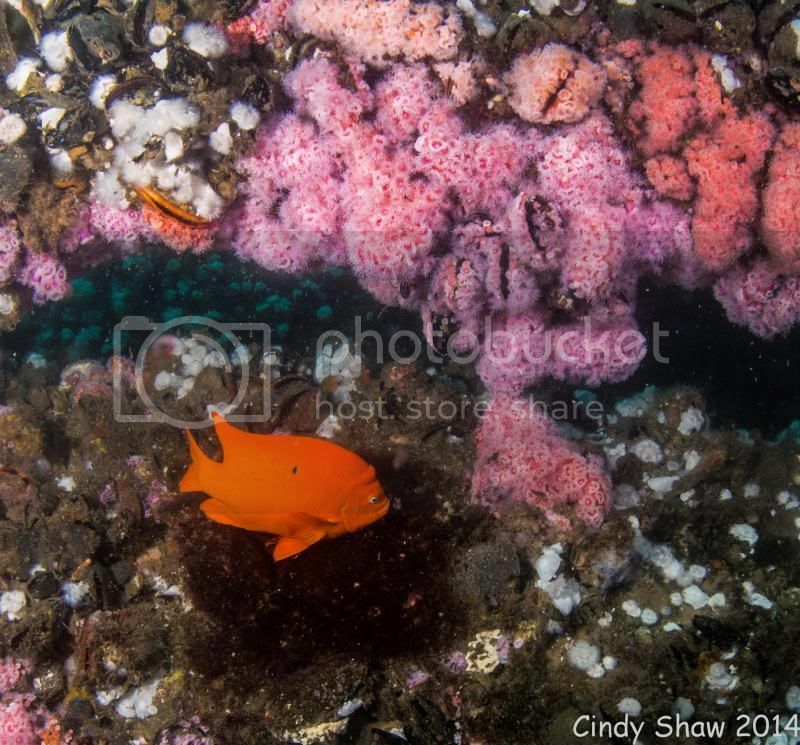 Large clouds of mackerel would flow through the structure like liquid smoke and the Garibaldi Dads were out in force protecting their nests. It was just a beautiful dive. The dives and the day had been beautiful and fun and I would have really been happy to count it a huge winner, but Mother Nature determined that it would be a day of education as well. While waiting for Captain Davey to back the Truth to the rig for our pickup we were able to answer that age old question: How much urine does a bull sea lion hold? The answer is a whole lot! 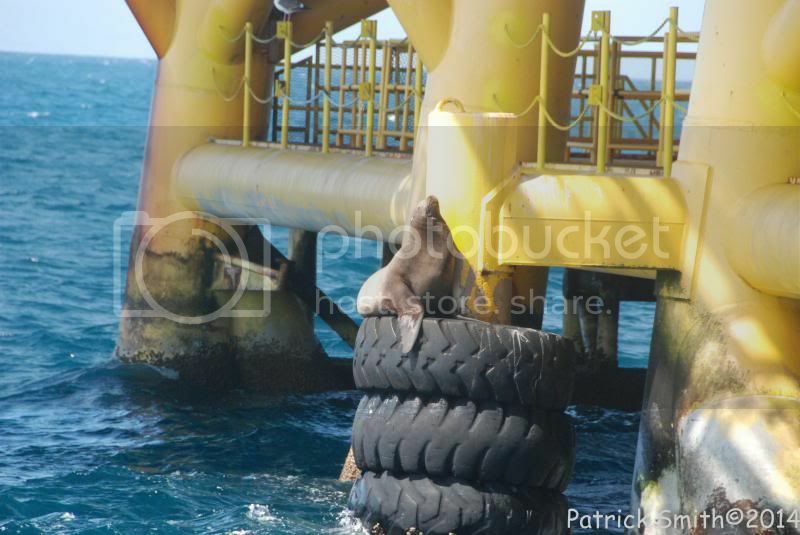 As we waited by the corner of the rig, a big male sunning himself on the truck tire bumpers that protect the structure showed us his capacity. A forty-foot circle of blue water became yellow water. It was very impressive. I probably would have appreciated it more observing it from the deck of the dive boat, but it was a “hands-on” (body-on?) experience that will not be forgotten. The irony of the experience is that I never pee in my wetsuit! Another wonderful diving day off Southern California! Thanks to the crew of Truth – Capt. Davey, deck crew, Brandon, KG and Cameron and marvelous galley goddess, Patty.